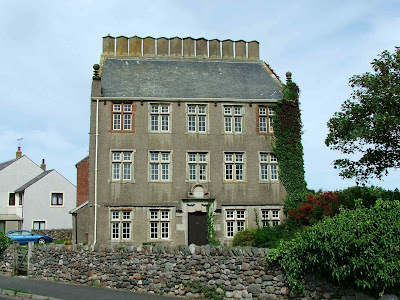 Rampside Hall, known locally as "the twelve apostles" owing to its dozen chimneys, is an oddity. Built sometime in the 1600's (possibly in 1634), the hall sits amongst houses built in the last fifty years, and seems to be the only remnant of times past in the area. It can easily be viewed from Roa Island Road which hugs the coast. It was probably built for the Knype family, and in 1649 it was noted that Rampside Hall was the home of the Papist, John Knipe. It has a simple floor plan spread over three floors. According to the Images of England web site, and a report of 1969, the hall retains many original features, including a well in the basement, timber partitioned rooms, an oak staircase and a couple of original fireplaces. The hall has a strong central cross wall creating the four basic rooms on each floor, inserted when the building was erected, to house the twelve fireplaces. The hall was re-roofed in 1810, at which point it would appear that a mock parapet that ran right around the roof line, was removed.